Ozzie Osbourne's daughter gets tattoo to remember Orlando shooting ""
Kelly Osbourne, daughter of Ozzie and Sharon Osbourne, got inked right after the Orlando shooting. The shooting occurred in a gay nightclub in Orlando, Florida. The gunman was identified as 29 year-old Omar Mateen, an American born of Afghan parents. This incident is considered as a hate crime and act of terrorism. The shooting is one of the most deadly acts committed by a single gunman, leaving behind 50 dead and 53 injured. Witnesses have identified the gunman as a regular patron of the club and having used many gay dating websites. Most of the casualties were Hispanic as the nightclub was hosting a Hispanic night. Osbourne revealed her look on her Instagram account stating that she had been meaning to get this tattoo for some time and the Orlando incident only hastened the process. This tattoo is a reminder that every moment of life is precious. 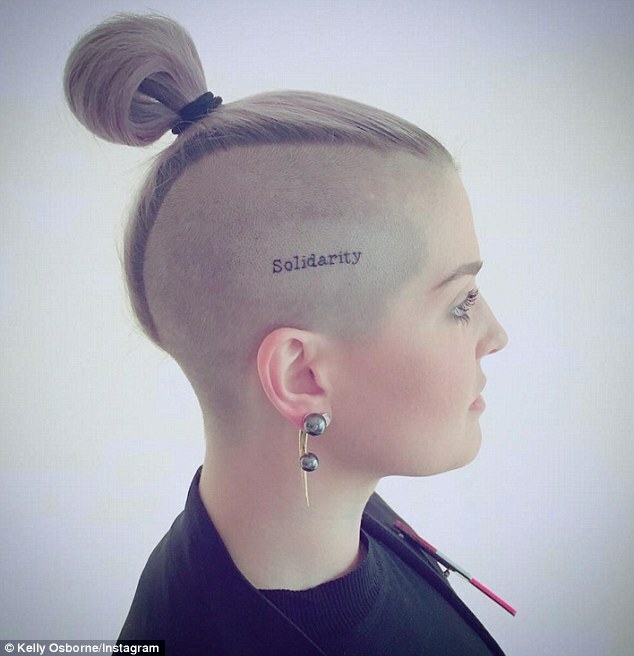 She got the tattoo on her head and simply says ‘Solidarity’. The reality TV star had this written on her head with marker earlier during the LA Pride Parade but decided to make it permanent after the mass shooting. She went on to say that together we can achieve what is impossible for those who stand alone. This is not the only ink this 31-year-old fashion designer sports on her head; on the other side, she has a tattoo that says “stories”.